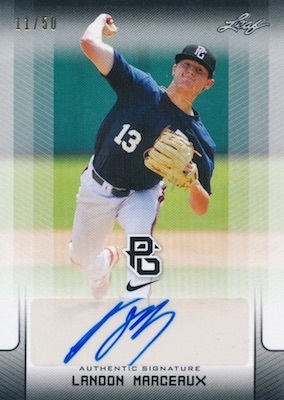 While traditional prospect sets have already carved out a strong market in the hobby, 2017 Leaf Perfect Game National Showcase Baseball allows collectors to get an even earlier look at potential major league stars while they are still in high school. Loading each box with 25 autographs, the 2017 Leaf Perfect Game National Showcase Baseball checklist features 300 high school standouts from the 2017 PG National Showcase event who are eligible for the 2018 MLB Draft. Mirroring the 2016 release, signed choices for 2017 include Base Autographs, Patch Autographs and Metal Autographs. Although targeting players this young can mean that many won't pan out, the large number of signers—plus the huge amount of autographs per box—provides a long-term collecting experience as graduating players enter college or go straight to the pros. Also helping the value in 2017 Leaf PG National Showcase Baseball is the low production of just 99 cases (or 1,485 boxes), with all cards in the box numbered to 50 copies or less. *Players with only 1/1 parallels noted below. PARALLEL CARDS: Silver**, Yellow #/25 or less, Blue #/15 or less, Green #/10 or less, Red #/5 or less, Purple 1/1, Printing Plates 1/1**. Cam McMillan, Matheu Nelson Silver base cards numbered #/20. See the full parallel breakdown with the spreadsheet. PARALLEL CARDS: Silver**, Purple #/25 or #/15, Pink #/20 or #/10, Black #/15 or #/7, Green #/10 or #/5, Red #/5 or #/3, Orange #/2 (Bonus Box), Gold 1/1, Super 1/1, Printing Plates 1/1**. LEAF ETCH PARALLELS: Wave Holo Blue #/12, Wave Holo Purple #/9, Wave Holo Pink #/7, Wave Holo Black #/5, Wave Holo Green #/4, Wave Holo Red #/3, Wave Holo Gold #/2, Wave Holo Orange 1/1, Gold Super Black 1/1, Gold Super White 1/1 (Bonus Box). 120 cards. Serial numbered #/20. PARALLEL CARDS: Red #/10, Green #/5, Yellow #/3, Orange #/2, Blue 1/1, Printing Plates 1/1**.